Another of the quick, but (to me) special dishes that Mr. Lazy Cook makes is the Hot Peanut Butter and Jelly (PBJ) sandwich on sprouted rye bread. Although utterly simple to construct, it is melt-in-your-mouth tasty and really nutritious, too. Hot PBJ, a glass of skimmed milk makes a light meal or tasty snack. Finish with a piece of fresh fruit. Lightly toast two slices of sprouted rye bread in toaster oven. 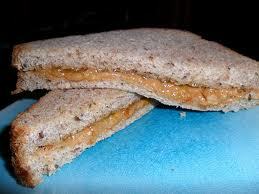 Remove and cover one with peanut butter and the other with grape jelly. Put back in toaster oven long enough to melt the peanut butter slightly. Remove, put together, cut in half and enjoy with a glass of skimmed milk. The sandwich contains 300 calories, including 8.8 grams of fat 1.4 grams of saturated fat, no cholesterol, 356 mg of sodium, 42 grams of carbs, 7 grams of fiber and 19 grams of protein. The 8 ounce glass of skimmed milk contains no fat, 3 grams of cholesterol, 130 mg of sodium, 13 grams of carbs, no fiber and 9 grams of protein. If you aren’t familiar with the benefits of sprouted grains bread, here are some facts. Flourless bread is made with grains and legumes that are sprouted before grinding into flour. Sprouted grains have increased vitamin and nutrient content because the seed is first sprouted, making it alive and active in its growth process. Diva Village lists the following as four benefits of sprouted grain breads, High in fiber, low in saturated fat, high in protein, rich in amino acids. Being a lazy cook doesn’t mean you have to skimp on nutrition.